Like Fredericksburg needs more sprawl and Interstate 95 through there needs more traffic. We'll call it the Silver/3 Pike or S3 Pike. That area doesn't need any more sprawl. The whole Fredericksburg region is like a giant monument to the Silver Companies and their vast wealth, and I'm not surprised that one of the options for the location of the main toll plaza would benefit them, because customers to their developments wouldn't be tolled. I also know that no one up there would ever use a toll road, and that this is unlikely to ever be built, like the Outer Connector before it (which pretty much died when the development of Celebrate Virginia before it). Argh. Another proposal destined to fail. I really don't see the point of that proposal. The whole Interstate 95 corridor between Richmond and Washington is the bane of my existence. That road has changed dramatically since the 1980s. A friend and I filmed it in 1994 from D.C. southward to Richmond, and even then it was terrible. Any additional development along the corridor pinches the gridlock that much more and without any alternate corridors (I tried U.S. 1 once, bad mistake), its just fuel on the fire. FYI, I am attempting to move posts that have topics for them out of the general VA thread and into those topics if possible. We will see how far I get with this. I have always been curious about the end of the separated HOV lanes on I-95 well south of the Beltway. First, are they to be extended? I seem to recall seeing unused pavement and bridge. Secondly, how much of a time savings can there really be southbound in the afternoon, when the HOV lanes merge into the general lanes? I seem to recall getting caught up in tieups there and seeing backups in the HOV lanes, too. Each time they extend it, they leave a stub end. Froggie probably has a better idea of where they may end, but in all honesty they should extend southward to Fredericksburg, perhaps where U.S. 17 leaves the freeway for its route east of Interstate 95. Is the Staunton bypass complete now? I drove the southern half in 2005 and have not revisited it. Also I noted on the latest Virginia official state map that Virginia 37 is shown as proposed to continue east of Interstate 81. What is the background on this? Yes the Staunton bypass is complete (was completed August 2006). And fully signed as VA 262...it replaced VA 275 on the northern segment. But it's not a full freeway, is it? Google Maps shows it as just a 2-lane highway with some intersections on the northern part. 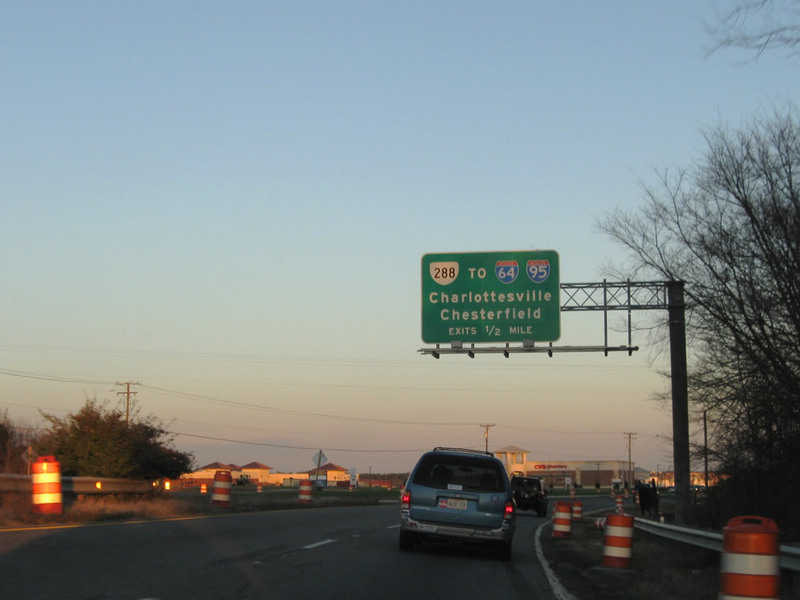 From I-81 south to west of Old Greenville Rd (but before VA 252), it's a 4-lane freeway. From there around to US 250, it's a Super-2 Freeway. From there back around the north side to just west of I-81, it's a Super-2 Expressway. The section of VA 262(including OLD VA 275) that is two lanes is on a 4-lane ROW throughout similar to VA 171 east of VA 134 to Poquoson right???? Actually, upon closer inspection I see that it is... hmm... I remember that now. Formerly rail bridges across 4 Mile Run. The commercial area you see south of the creek and east of US 1 was built on what was originally a huge railway yard. The area is called "Potomac Yards". I do some of my shopping there. It's the closest Best Buy and Barnes & Noble to me, and the second-closest Target. Since I'm a railfan as well as a road geek, I know that while "Potomac Yards" may have been the official name of the location. However, railfans and railroad employees alike generally referred to it as "Pot Yard". (I think that name was made before Pot became a synonym for a certain plant people smoke. I am about 95% sure that this is the case but isn't there now a ramp from VA 168 North to VA 190(Kempsville Rd)? I believe that it is Exit 12 if it exists. Yes there is. I was just down there recently and they were wrapping up some construction on Kempsville, which was the first time I looked and noticed that ramp. It's from 168 North to Kempsville East only though. And it's already on google earth too btw. BTW, that ramp has been there for several years. Yeah I remember seeing it going to Nags Head about 3.75 years ago. I just knew it was there but every website that has something on the Chesapeake Expressway(VA 168) still says that there is no connection there. That imagery is a bit dated. There's been an apartment building and grocery store on that vacant piece of land for a couple of years now. The bridges are still there though, I think. If Alexandria decides to replace the shopping center to the south with a street grid in the future, I wonder if those bridges would be carrying vehicular traffic. Does anyone know exactly what's happening on the VA 288 South C/D Road at US 60? Yes. In a word, sprawl. 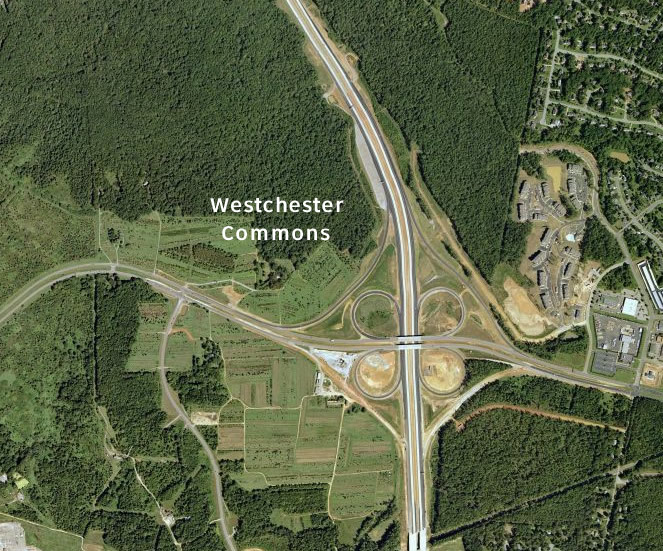 Westchester Commons, a huge outdoor type shopping mall is being constructed at the northwest corner of the interchange. And a part of that construction involves a ramp leading directly to the new shopping area. Nice, eh? from SyntheticDreamer When signs go up, I'll take photos of them so I can send them to both you and Froggie. It actually took three tries for me to get a response from DPW; I guess former Mayor Wilder wasn't interested at the time, and now that Richmond has a new mayor, they're more interested in getting this stuff fixed. ^^ The zigzag markings, I think, are a good idea. They'll get more drivers attention, since it's something different. You'll still have some folks that won't pay attention (or care) one way or the other. Oh we have those zigzags a lot in the Netherlands. Works quite good to get the drivers attention, especially in build-up areas with lots of trees etc. where a pedestrian / cyclist crossing is not always very clear to see. In Britain they're used at crosswalks and it's illegal to stop or park on them. Schools normally have yellow zigzags near the entrance where stopping is forbidden during school hours.